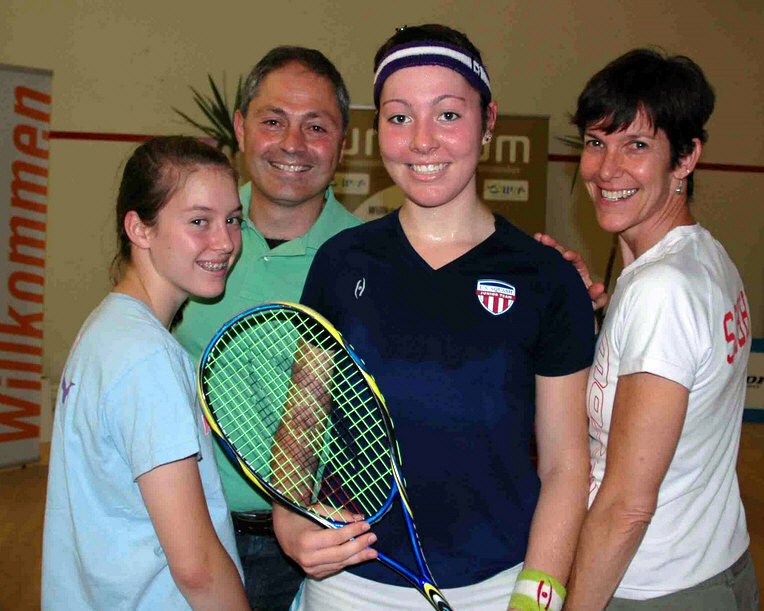 Amanda Sobhy celebrated the perfect 17th birthday by beating Egyptian rival Nour El Tayeb in the final of the Women’s World Junior Squash Championship to become the first US winner of the prestigious event in its 16th year, at the ACR Sportcenter in Cologne, Germany. 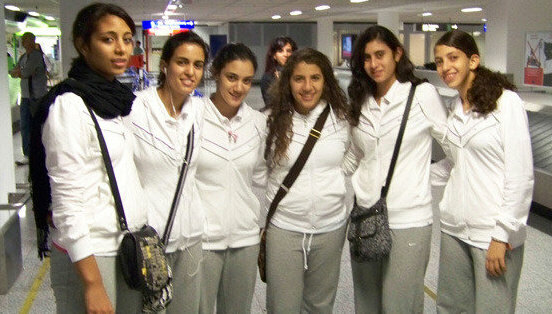 It was Sobhy’s first victory over the Egyptian in four meetings on the junior international circuit since January 2008. The victory not only ends Egypt’s seven-year stranglehold on the title since 2003, but also consigned Cairo-based El Tayeb to a runner-up finish for the second year in a row. "There was a period of time before the tournament when I didn't believe that I could win this, however, as the tournament became closer I started believing in myself more. 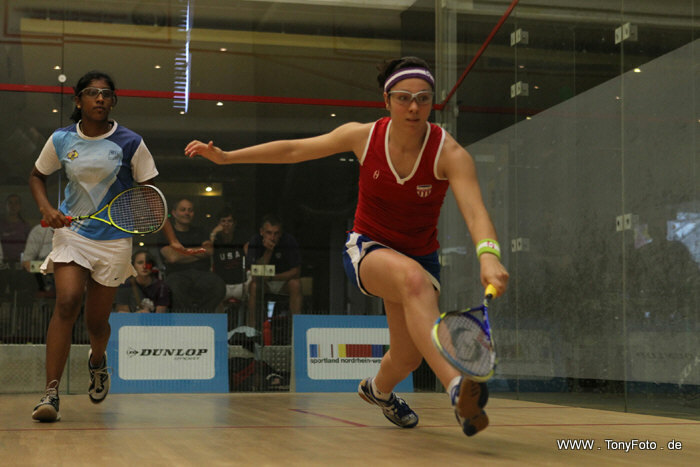 I told myself that I could win the world junior open, and that was what I was aiming for. "I knew that when playing Sherbini I had to come out strong from the first point and show everyone that my win against her last year was no accident, and that I can beat her again. When I won, it felt like the finals. I couldn't help but cry from joy again like last year. "Winning the Worlds is by far the best accomplishment I have ever achieved in my career so far, and the amount of publicity and recognition I get from it makes me feel like I'm up there with the big names. "I don't have any specific goals right now for I have just achieved mine, so I'm in search of a new goal. I'm still always looking forward to improving my WISPA ranking and results. "There's a long list of people who I would like to thank. These are the people who are a big part of my squash life whether they are trainers, coaches, or just friends. "To start I would like to thank my entire family: mom, dad, Omar, Sabrina, the USA team and my coach Jack who was there for everyone of my matches supporting me, and lastly the entire "team sobhy" as I would like to call it: Joe, Theo, Natalie, Rodney, Eric, Jamal, Shaun, Jackie, and the rest of my family and friends back home who constantly support what I do. "Right now, as World Champion, I'm very sore and could use a nice vacation!" Both semi-finals at the ACR Centre in Cologne produced upset results, and both were re-runs of matches that shook last year's championship in Chennai. The in-form Amanda Sobhy dethroned the defending champion and top seed in the first semi-final, repeating her straight games win over Nour El Sherbini just days after the Egyptian, then just 13, had won the title in Chennai (Dream team shaken by the States). Ranked #36 in the world after becoming the youngest player ever to win four WISPA titles, Sobhy, who turns seventeen tomorrow, again got the better of three close games to become the first American to reach the world junior final in sixteen editions of the event. 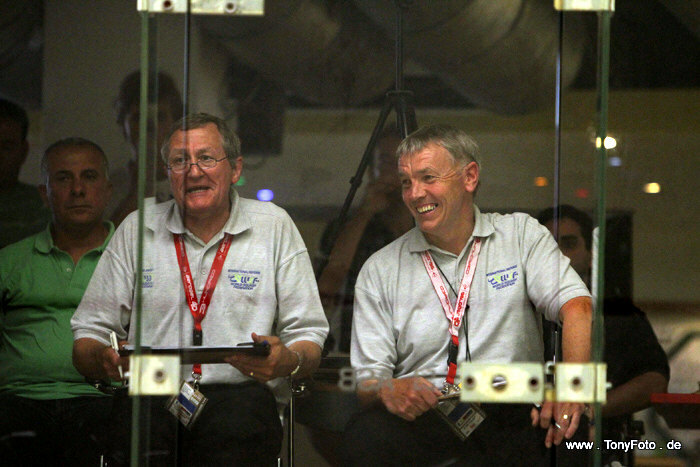 At 9-10 in the third Sherbini served to the left-handed American's forehand, and the ball was slotted neatly for a crosscourt nick ["it reminded me of Dittmar vs Jahangir in the 89 Singer World Open in Malaysia," said a jubilant US coach Jack Wyant] to seal a famous victory. The second semi-final featured another upset, and another re-run of a major match from last year's event. In Chennai Dipika Pallikal was the top seed, but Nour El Tayeb destroyed home hopes in the semi-final (Tayeb terminates Indian dream), and tonight the Egyptian did it again, like Sobhy getting the better of three very close games to advance to her second consecutive final. 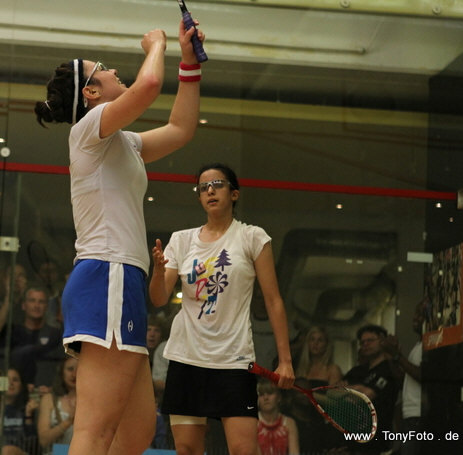 Dipika Pallikal was once again not able to go past a determined Nour El Tayeb in the semi finals at the World Junior Individual Squash Championship in Cologne, Germany. Every game was close with both players using the front of the court more often than required. 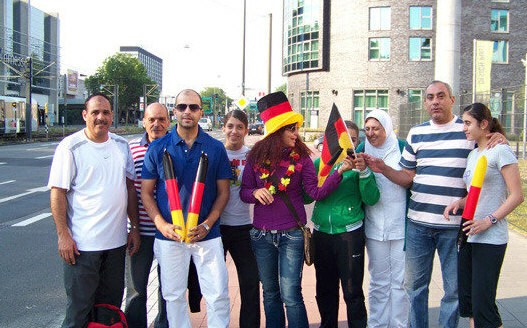 Dipika seemed in control of all three games but Nour won the 'big points' and moved a step away from winning the title. In the final, fourth seeded Nour will play third seeded Amanda Sobhy who upset the reigning world champion Nour El Sherbini. Both matches were similar as Sherbini seemed to always have the lead but a spirited effort from Amanda saw her through in straight games. 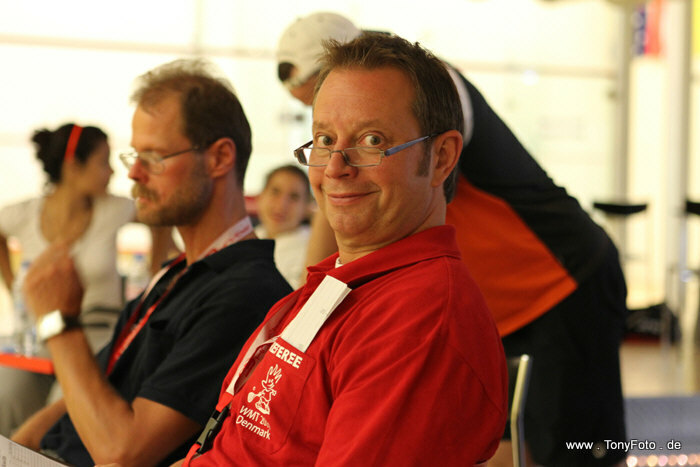 Prior to the evening's semi-finals, the playoff semis progressed throughout the day at the ACR centre in Cologne. 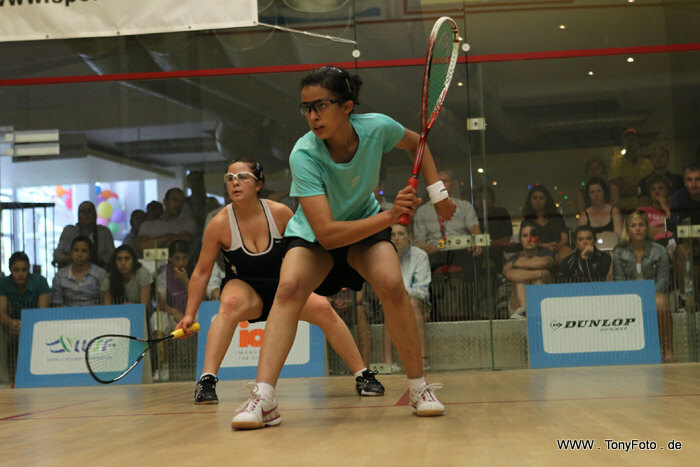 The 9/12 matches were both hotly contested, with Catalina Pelaez and Salma Hany both winning thrillers - Pelaez saw a two game lead disappear but managed to win the decider 15/13 against Tamika Saxby, while Hany won a tight five-game encounter against fellow-Egyptian Farah Abdel Meguid. 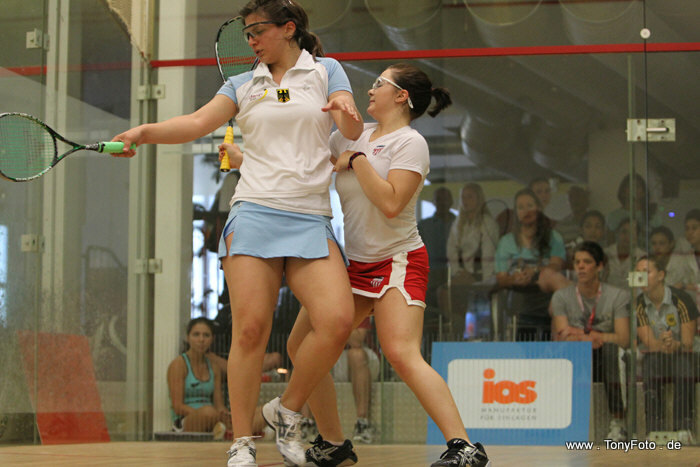 Meanwhile in the 5/8 matches it was double success for Egypt with Kanzy El Dafrawy and Nouran El Torky setting up a fifth-place meeting with wins over Olivia Blatchford and Anaka Alankamony. 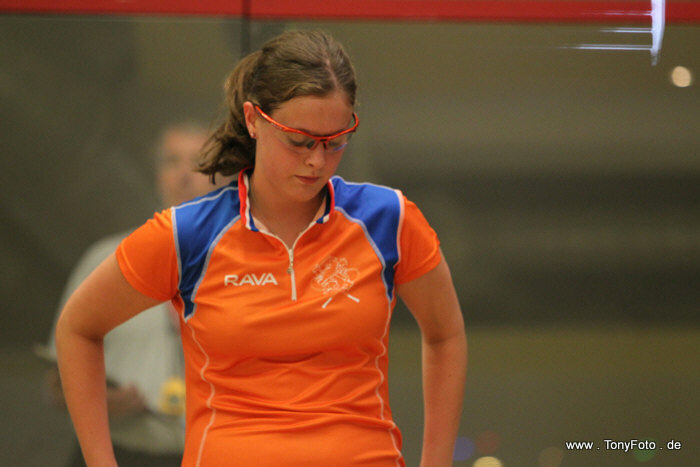 "I am extremely happy that I won, and especially pleased to win in three with the final coming up tomorrow. "I'm also glad that my family is here to support me, perhaps we can have a very nice birthday celebration tomorrow!" 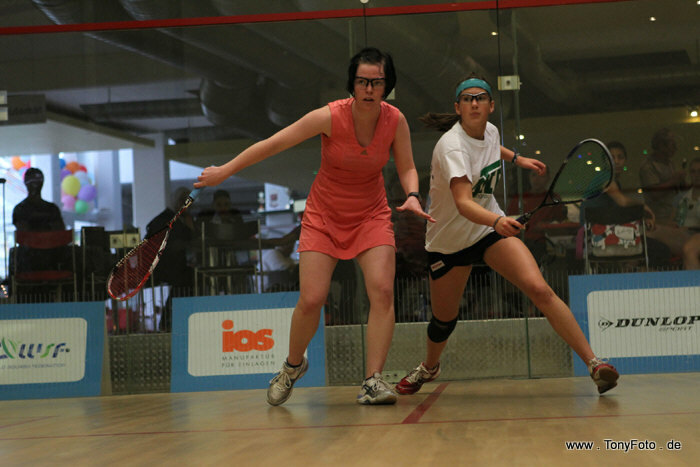 The top eight seeds contested the quarter-finals at the ACR Sportscenter in Cologne, and it was the top four who went through, setting up two intriguing semi-finals between the players ranked 36, 38, 40 and 42 in the world. First up was an all-Egyptian matchup between defending champion Nour El Sherbini and Nouran El Torky, with the top seed winning 11/7, 9/11, 11/8, 11/7. 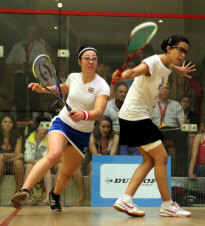 In-form American Amanda Sobhy then lived up to her third seeding with a 12/10, 11/4, 11/6 victory over Anaka Alankamony. Sherbini and Sobhy last met immediately after Sherbini won the title in Chennai last year, the American stunning the new champion with a straight-games win in the team event. 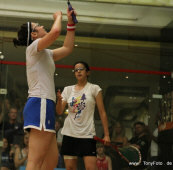 Since then Sobhy has gone on to win four WISPA events, and earn a world ranking of 36 compared to Sherbini's 42. Nour El Tayeb denied the Usa a second semi-final appearance as the Egyptian fourth third seed, runner-up last year, beat Olivia Blatchford 11/1, 11/6, 11/7. Another good day for the seeding committee was completed when India's Dipika Pallikal came from a game down to beat a determined Kanzy El Dafrawy. It was El Tayeb who toppled the top-seeded home favourite Pallikal in the semi-finals of last year's event, so having laid to rest one demon in the second round, revenge could once again be on Pallikal's mind, although Tayeb's world ranking is higher, 38 compared to Pallikal's 40. 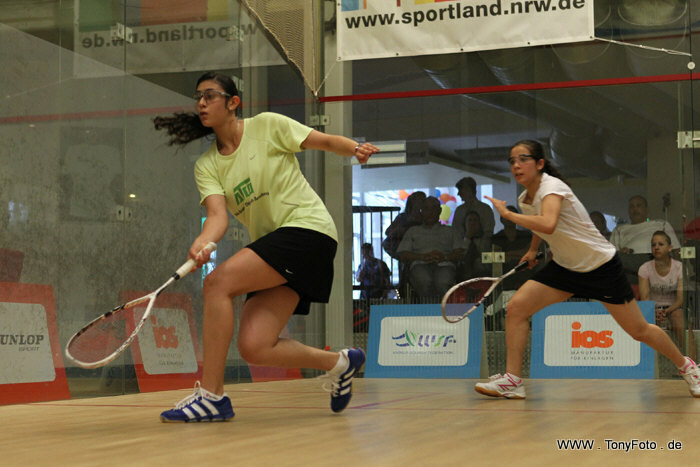 The second round of the World Juniors in Cologne saw the top eight seeds all progress to the quarter-finals, with four Egyptians joined by two Americans and two Indians - a record for both nations - in the last eight of this first annual championship. Defending champion Nour El Sherbini beat France's Julia Lecoq in straight games, but seventh-seeded Nouran El Torky was taken the full distance, twice coming from behind before seeing off Australia's Tamika Saxby. The next pair of matches also went to seeding as India's Anaka Alankamony beat Catalina Pelaez to set up a meeting with third-seeded American Amanda Sobhy, who beat Yathreb Adel in four games. 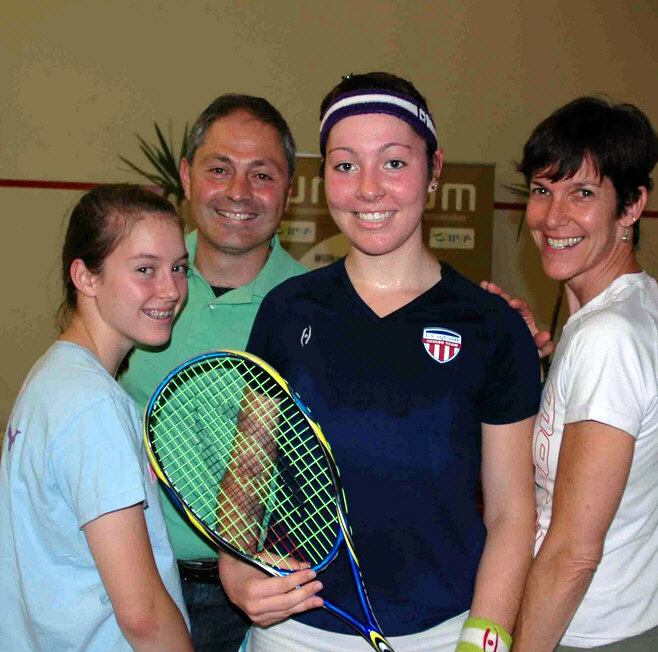 There was more American success as Olivia Blatchford beat Melissa Alves in straight games. 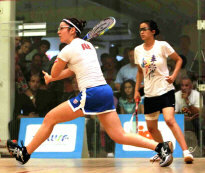 She'll meet fourth seed Nour El Tayeb after last year's finalist beat fellow-Egyptian Farah Abdel Meguid in four games. 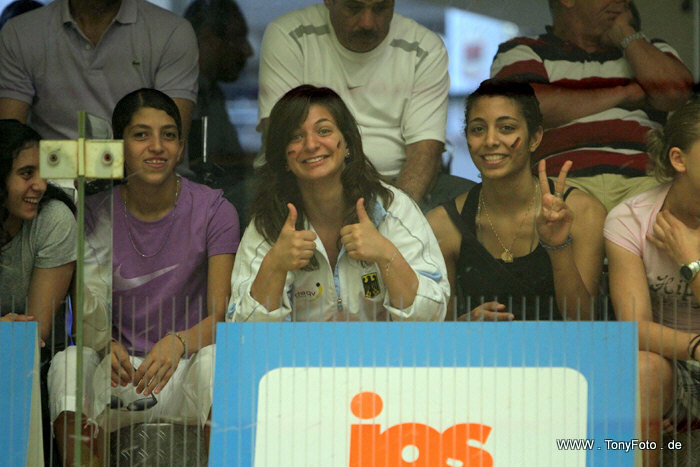 A good day for the seeding committee was wrapped up by wins for Kanzy El Dafrawy and Dipika Pallikal. 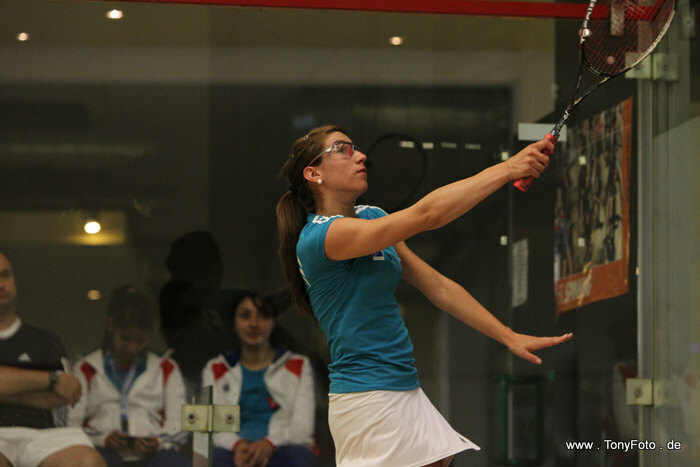 Egypt's El Dafrawy put out the last of the French challengers, Cyrielle Peltier, while second seed Pallikal avenged her BJO defeat at the hands of Salma Hany, both in straight games. 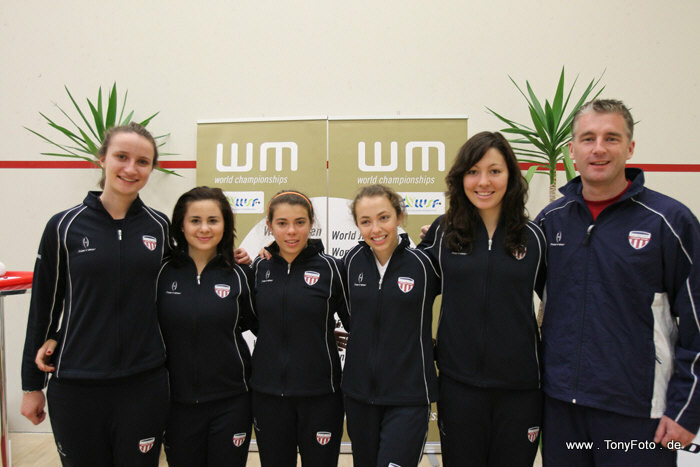 Dipika Pallikal and Anaka Alankamony from India joined four Egyptians and two girls from USA in the quarterfinals at the World Junior Women's Individual Squash Championships in Cologne, Germany. This is the first time ever that two Indians will feature in the quarterfinals at the World Championship. Anaka was the first to enter the quarters after her clinical display against a determined Catalina Pelaez from Colombia. Although it was a straight game win Anaka was drawn into many gruelling rallies where Catalina retrieved some amazing balls diving around the court. Anaka kept her cool and despite being down in both the first and third game played some delightful volleys and drops and often wrong footed Catalina with her cross court drives. In the end, Anaka proved to be too consistent for her senior opponent. Dipika trailed 0-5 in the first game to level scores and take the game to the tie breaker against Salma Hany from Egypt. The hard drive and boast was used extensively by both players throughout the match, each trying to out hit each other. Although Dipika made errors on her boast she proved her superiority with her lethal drives to win the crucial first game and the match in straight games to shrug off her defeat earlier this year at the British Juniors. 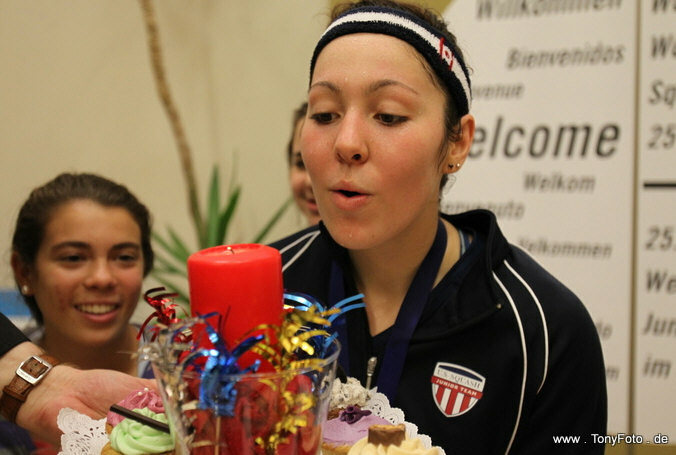 The first annual edition of the Women's World Juniors is under way in Cologne, with sixteen first round matches on the opening day. It was generally plain sailing for the sixteen seeded players, with all but two winning in straight games - although seventh seed Nouran El Torky needed extra points in two of her games to fend off the challenge of France's Elvira Bedjai. 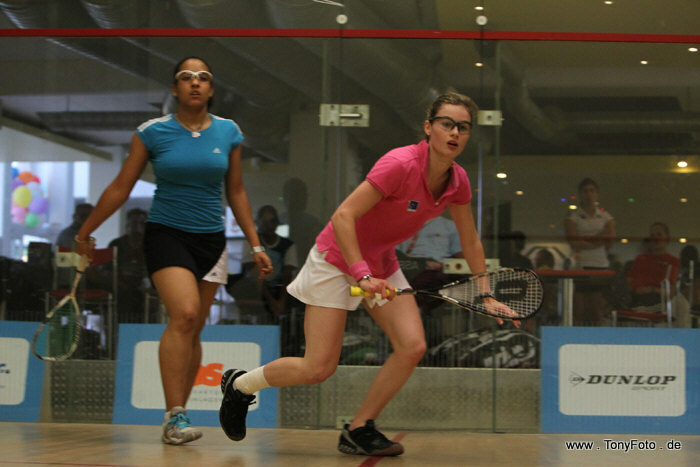 Home player Franziska Hennes and India's Aparitha Balamurukan came closest to surprise results, taking Tamika Saxby and Julia Lecoq the full distance before losing out in the deciders. Six countries are represented in the last sixteen, and six of the matches have Egyptian interest, with defending champion Nour El Sherbini leading the way, while second seed Dipika Pallikal is joined by compatriot Anaka Alankamony. 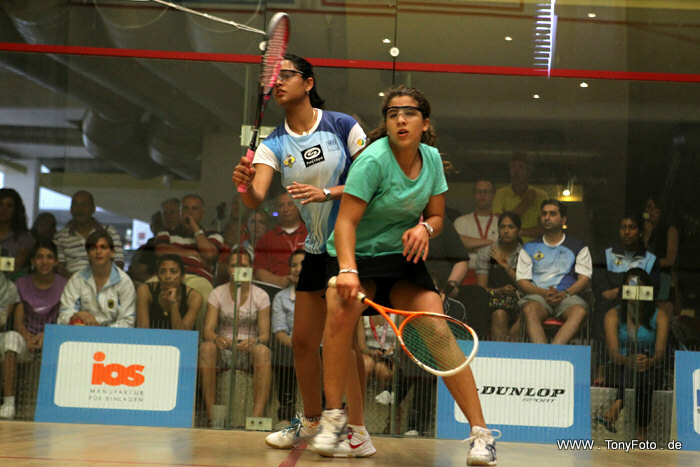 Pallikal faces a rematch with Salma Hany, who stunned the Indian world number 40 in January's British Junior Open, while El Sherbini faces Julia Lecoq, one of three French girls in the last sixteen. 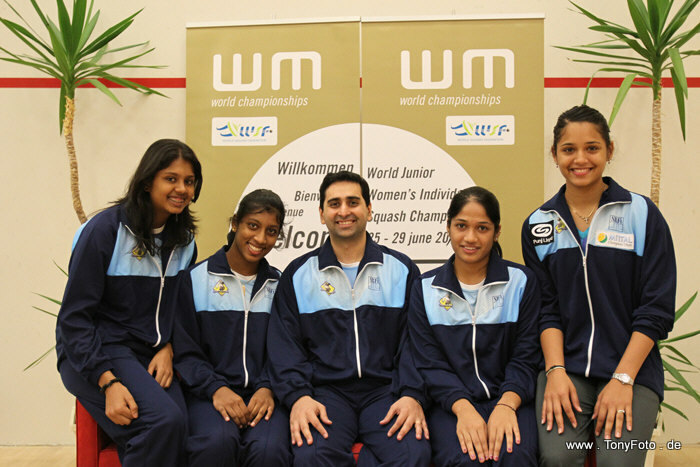 Dipika Pallikal and Anaka Alankamony moved into the round of 16 at the World Junior Women's Individual Squash Championships in Cologne, Germany. Dipika disposed of Katie Tutrone from the USA with ease while Anaka had to work for her straight sets victory against Ashley Tidman from France. 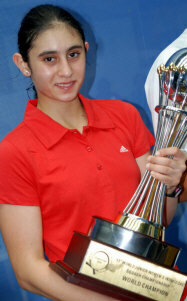 Dipika is up against Salmy Hany from Egypt tomorrow, who defeated Dipika early this year at the British Junior Open. Anaka is slotted to play Columbian Catalina Pealez in her next round. It was a mixed day for the Indian contingent as Aparajitha Balamurukan & Anwesha Reddy lost to higher ranked opponents. Aparajitha after losing the first game showed her grit and won the next two games being aggressive and working very hard. Aparajitha fought till the end but her higher ranked French opponent Julia Lecoq leveled the game in the fourth and kept moving Aparajitha to all corners, at the end Lecoq was more consistent and won the match in the fifth game. Anwesha gave it her best but it was not good enough against 9/16 seed Farah Abdel Megiud from Egypt, going down in straight games. 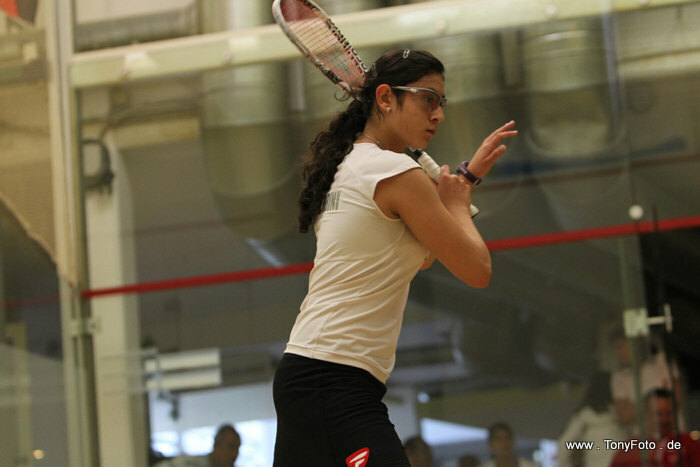 Just ten months after becoming the youngest world champion in the history of the sport, Egyptian teenager Nour El Sherbini is seeded to retain her title in the Women's World Junior Squash Championship this week in Germany. 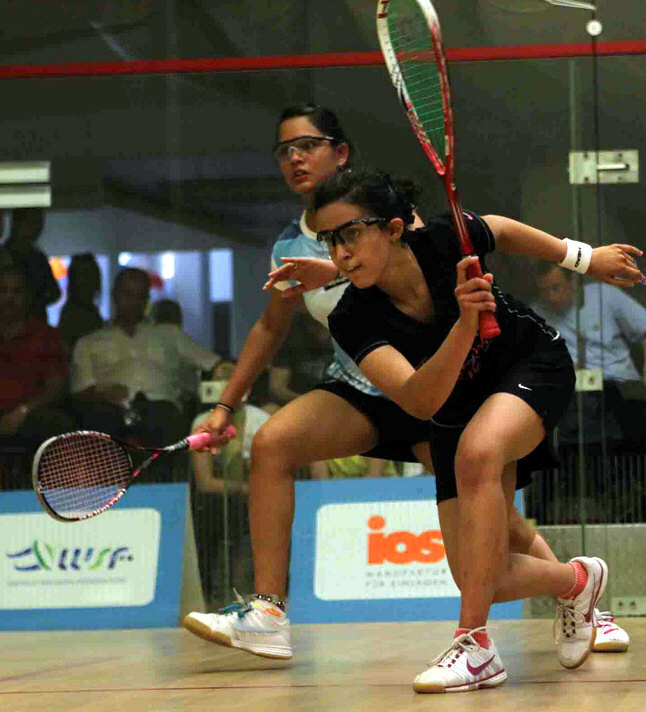 Remarkably, the 14-year-old favourite from Cairo is the second youngest player in the Under-19 championship draw – and her anticipated opponent in the final, India's second seed Dipika Pallikal, will only be three months short of her 19th birthday. 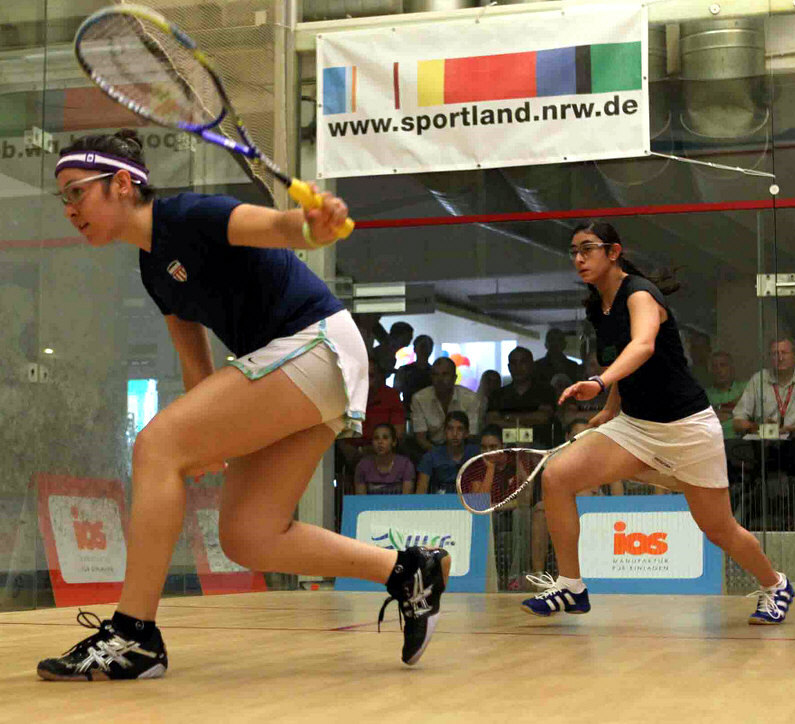 The 2010 Women's World Junior Championship, with entries from 11 countries, will take place at the ACR Sportcenter in Cologne. 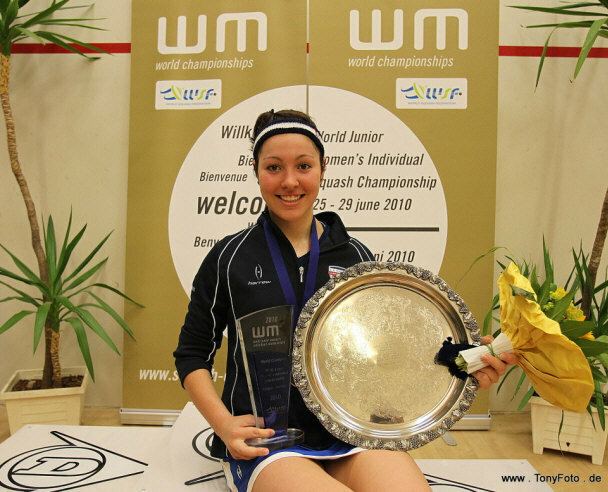 El Sherbini, from Alexandria, was only expected to make the last 16 in last year's world junior championship in India – but despatched the second, sixth and eighth seeds before overcoming the fourth seed in the final to record her historic triumph. Pallikal is the only player to be making a fourth appearance in the event after making her debut in the 2003 championship in Egypt – and will be looking to make up for the disappointment of failing to win the title last year as favourite. 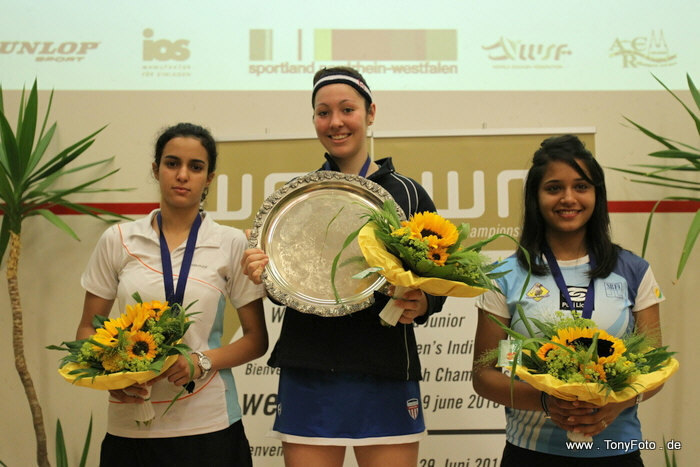 The 18-year-old from Chennai has already made her mark on the WISPA World Tour. Pallikal picked up her maiden title at the Indian Challenger No5 on home soil in Calcutta in April, and now boasts a world No40 ranking. 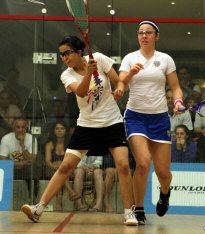 But both top seeds will be wary of the two other players expected to make the semi-finals: third seed Amanda Sobhy is a left-hander from the USA who has already claimed her place in squash history by becoming the first 16-year-old to win three WISPA Tour titles – success which has taken the New Yorker to 36 in the world rankings. 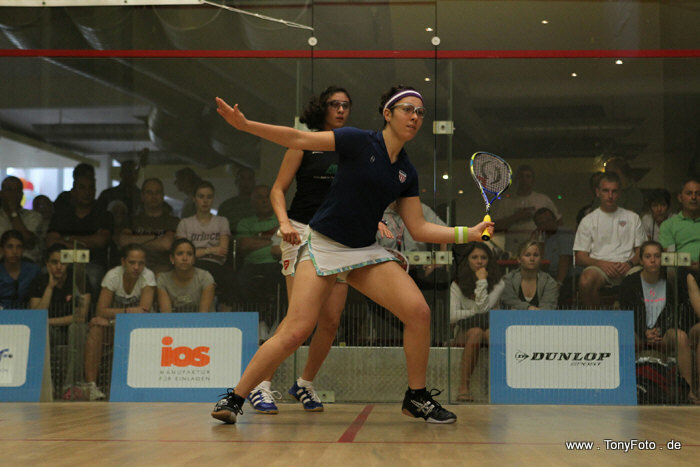 Nour El Tayeb is the second highest-seeded Egyptian in the field. The 17-year-old from Cairo, seeded four, reached last year's final against expectation – and has since secured her first Tour trophy and a career-high world ranking of 36. 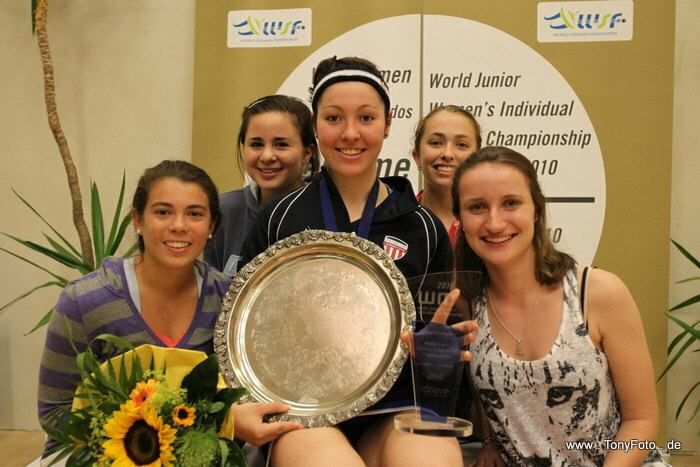 2010 sees the first annual edition of the Women's World Junior Championship, with the boys heading for Ecuador in July for their individual and team championships. Egypt's Nour El Sherbini, who at 13 became the youngest-ever world champion last time out in Chennai, is seeded to retain her title but is sure to face stiff opposition, with the second third and fourth seeds all ranked just above her in the world rankings. India's Dipika Pallikal, who has just risen to world #40, is seeded to meet El Sherbini - #42 - in the final, but the world rankings show just how close a competition this is, with last year's runner-up Nour El Tayeb at #38 and the in-form Amanda Sobhy at #36 completing the top four seeds. At five and six Kanzy El Dafrawy and Olivia Blatchford are ranked #48 and #51, and both are serious title contenders. 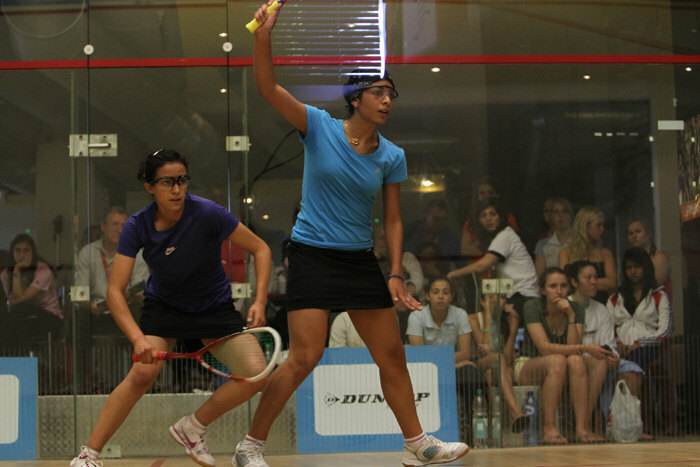 Sherbini is scheduled to meet compatriot Nouran El Torky (7th seed, #78) in the quarters and Sobhy in the semis, while Pallikal faces an intriguing second round clash with Salma Hany, who upset the Indian favourite in January's British Junior Open, followed by Dafrawy and Tayeb or Blatchford ... both far from easy routes.